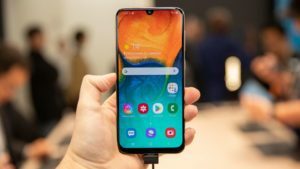 Samsung has introduced its New Mid-budget segment smartphone Samsung Galaxy A50 under its A series last month in India. The smartphone comes with great specifications and features and offers a great value for money package. On the other hand , Xiaomi has also introduced Redmi Note 7 Pro under its Redmi Note Series. Both the Smartphones offers good value for money and price closer to each other. In this post we are comparing Samsung Galaxy A50 vs Redmi Note 7 Pro in terms of Performance , Camera ,battery etc. The Redmi Note 7 Pro is cheaper than Samsung Galaxy A50 ,it starts from Rs.13,999 for 4GB RAM and 64GB Internal storage variant and top of the line 6GB RAM and 128GB variant costs Rs.16,999. Whereas Samsung Galaxy A50 Starts from Rs. 19,999 for 4GB RAM and 64GB Internal storage variant and 6GB RAM variant Costs Rs. 23,990. 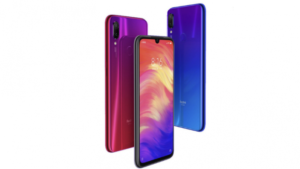 For he Buyers looking for 128GB Variant , there is not option rather than buying Redmi Note 7 Pro , as A50 doesnot comes with 128GB Internal Storage option. When it comes to Pricing , According to MyGadgetReviewer , Redmi Note 7 Pro is much more Value for Money Device as compared to Samsung galaxy A50. The Samsung Galaxy A50 comes with triple rear camera setup with 25MP Primary Sensor with F1.7 aperture+ 5MP seconday sensor with f2.2 aperture and a 8MP sensor with f2.2 aperture. As far as front camera is concerned ,there is 25MP front facing camera present. On the other Hand , Redmi Note 7 Pro comes with a 48MP primary rear camera sensor with f/1.79 aperture , Spectra 250L and Sony IMX586 sensor and a 5MP secondary sensor. At the front there is a 13MP Front Camera in RN7Pro. 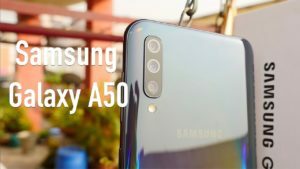 In Camera department , Samsung Galaxy A50 is the clear winner as it gets Triple Rear Camera setup and 25MP Front Camera makes it a better camera centric smartphone in Samsung Galaxy A50 vs Redmi Note 7 Pro camera test. Coming to the Performnce , the performance of a smartphone plays an important role while choosing a smartphone. The overall Gaming Performance also depends upon the processor of the device. The Xiaomi Redmi Note 7 Pro is powered by Latest Qualcomm Snapdragon 675 Processor coupled with Adreno 612 GPU. Whereas Samsung Galaxy A50 is powered by Samsung Exynos 7 Octa 9610 processor coupled with Mali-G72 MP3. 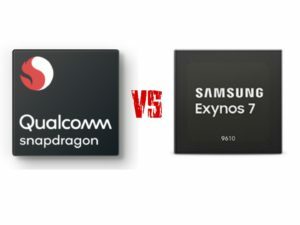 In terms of Performance Snapdrgon 675 is far better than Exnos 7 octa 9610 chipset. In terms of Gaming Adreno 612 is also better tha Mali-G72 MP3. At the end Redmi Note 7 Pro is better than Samsung Galaxy A50 in terms of performance. The Samsung Galaxy A50 comes with a 6.4 inches of SUPER AMOLED display with a screen resolution of 1080 x 2340 pixels. On the Other Hand Redmi Note 7 Pro comes with a 6.3-inch Full HD+ 2.5D curved glass display with Gorilla Glass 5 protection .The Resolution of both the display’s is 2340 ×1080 pixels and aspect ratio is also same 19:5:9. 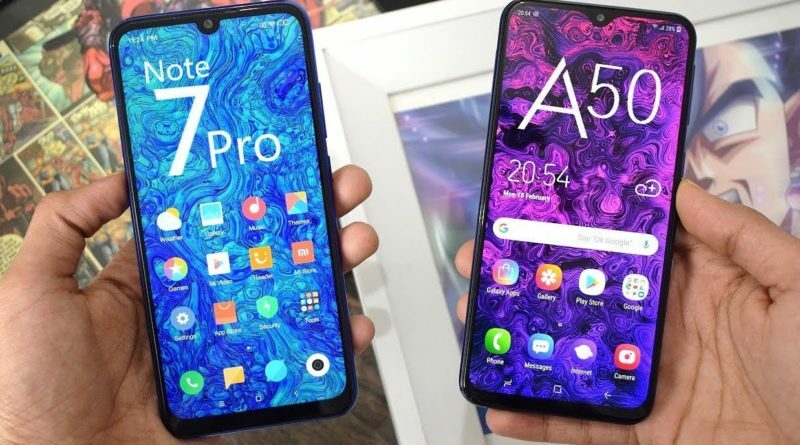 The Galaxy A50 gets SUPER AMOLED display whereas RN7PRo gets IPS LCD Display. The display quality of Samsung Galaxy A50 is far better than Redmi Note 7 Pro and in bright sunlight coditions, A50 display is more visible than of Redmi Note 7 Pro. Also the Galaxy A50 gets in-display fingerprint sensor whereas Redmi Note 7 Pro sensor is placed at the Rear. 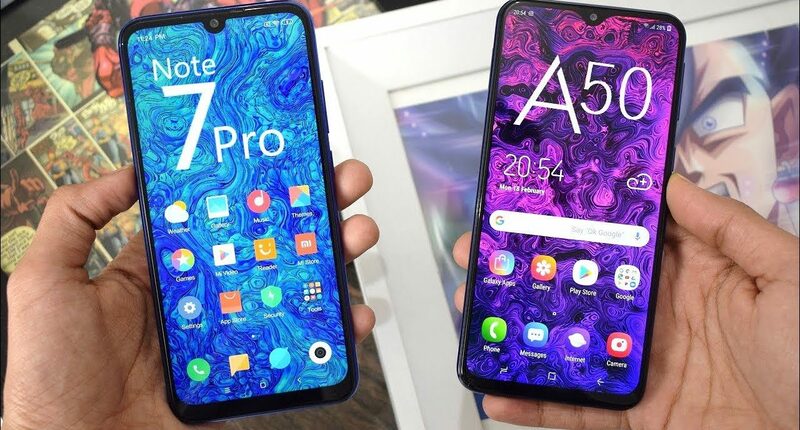 In terms of Display of Samsung galaxy A50 vs Redmi Note 7 Pro comparison , Samsung Galaxy A50’s display is much better.